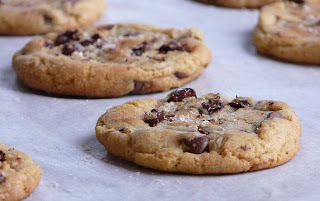 I've always loved chocolate (although I confess it is milk chocolate that I love) and salt. 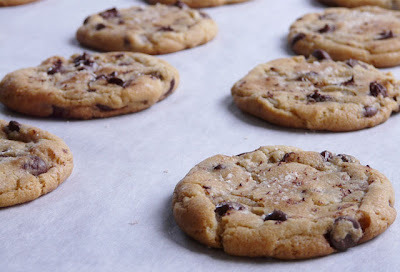 So these cookies of Jacques Torres sprinkled with sea salt are the perfect cookie. Earlier this week I mixed up a batch of cookie dough and then baked nine a day until they were gone. Shared with our neighbours and took a few to give to our son when we met him for lunch in Victoria on Tuesday. Me too it's milk chocolate.. and if the recipe is Jacques' and yours..they must be fabulous! I can't get used to the idea of salt being used like this (or when it's used with caramel), but these are two flavors that my Ole Sweetie-Pi loves so I think he'd really enjoy these as well. Cookies look irresistible.